The Radiance Daylight LED Monolight from Genaray is a Chip-on- Board (COB)-powered fixture with a 5600K color temperature that consumes only 230W of power while outputting up to 23,000 lux at a distance of 3', while maintaining a high CRI/TLCI rating of 95. Output is flicker-free to allow shooting at high frame rates and is dimmable from 100 to 0%. While you can make light intensity adjustments locally on the fixture, you can also can also do it remotely from a console via onboard DMX or make them at distances up to 164' using the included wireless remote control. Ideal for sound-sensitive environments, the Radiance employs whisper- quiet fans that dispel what little heat that the unit generates, both protecting the light's electronics and lengthening the life of the LEDs. The performance of the Radiance is backed by its clever design. The all-metal construction provides years of rigorous use, while the separate controller/power supply reduces the weight of the lamp head allowing greater mounting options. The Radiance is ready for worldwide use thanks to its 100-240 VAC power supply, but you can also run it on two optional V-mount batteries when mains power is unavailable. The Radiance ships with a reflector and a carrying case for storage and transport. The Radiance COB LEDs output an impressive daylight-balanced 23,000 lux - plenty of power for use in large locations. Low power draw and negligible generated heat make it an easy replacement for your hot light. The light's color temperature is a solid 5600K with CRI/TLCI rating of 95. You can you tweak the light intensity from 100 to 10% without flicker, allowing shooting in slow motion or at high frame rates. While you can make adjustments to brightness locally on the fixture, you can also do it remotely from a console via onboard DMX. For another control option, Genaray also includes a wireless remote with a range of 164'. The Radiance is ready for worldwide use thanks to its 100 to 240 VAC power supply, but you can also run it on two V-mount batteries in situations where mains current is unavailable. The whisper-quiet fans protect the light's electronics and make for a very long life for its LEDs. Cool-running COB LED array generates next to no heat, dispelling concerns about placing it close to your subject and allowing you to position it in tight quarters. The Bowens front accessory mount makes it not only compatible with Genaray light-shapers, but also with those made by the many manufacturers who employ this popular mount. Box Dimensions (LxWxH) 24.1 x 16.9 x 8.9"
Radiance Daylight LED Monolight is rated 4.4 out of 5 by 5. 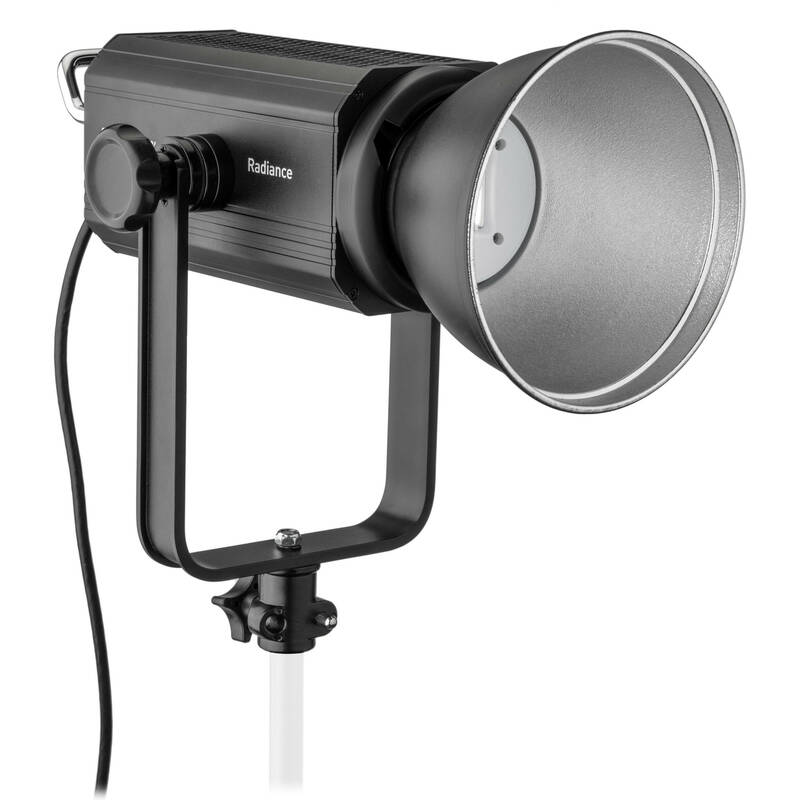 Rated 4 out of 5 by Benton from A very nice light but with a high hidden cost This light is brighter than the Aputure 300D and is way less complicated to set up, but Im giving it one less star for requiring the use of 15a V Mount batteries which are very expensive and very rare. The Aputure 300D requires 12a batteries which are way more plentiful and much much cheaper. Why a 300 watt light needs less amperage than a 230 watt light is a mystery to me. Rated 4 out of 5 by ArtVideo from Not that impressed. I bought a Jinbei EF-200 1 day before I ordered the Generay I bought at BH. I don’t know why BH doesn’t carry Jinbei products. btw...There is no perfect LED color on CRI. Even at 97. The Generay is a tiny microscopic measure bit toward magenta and the Jinbei is the same tiny bit towards green. Both look good enough as far as color CRI. You can mix these two and the difference in color temperature is negligible. More about Jinbei vs Generay: Jinbei EF-200: PROS - HALF of the price of the Generay Radiance - 25% more powerful than the Generay, - 32 watts less power consumption at 100% - NO BALLAST to carry around. CONS: - in the box, only comes with the light, cup protector and a power cord. - Fan noise is low but not acceptable to quiet rooms. PERFECT LIGHT, fan semi quiet. There is a way of taking care of fan noise with these units but I’m not going to advertise here how to do it because I don’t want electronics illiterate customers to temper with these lights. Generay PROS: - comes with case, reflectors and remote. The Jinbei only comes with the light and the power cord. - product is beautiful including the ballast which has a beautiful blue panel and touchscreen. Generay: CONS: - 1/2 stop weaker than the Jinbei - twice the price of Jinbei - a ballast to carry - wireless remote doesn’t have a power / sleep option. Only up and down intensity. Consumes more power and provides less light output than the Jinbei. If I replace the fan on the Jinbei, this light output will beat the Aputure 300D and the Generay while having a SILENT FAN. The Generay has a quitter fan but less power output and consumes more electricity. CONCLUSION: -Fan noise: Generay wins - light output: Jinbei ED-200 wins. - price: Jinbei wins CRI: as good as it can get for a LED, both good. Rated 4 out of 5 by ArtVideo from Price of this item changes like crazy Price of this item changes like crazy. Everyday it’s a different price... Great light, very happy with it. It’s 1 FULL STOP brighter than the Aputure 300D. That alone should do. What's the range of run times at full power depending on battery size at full power? Could I get at least 75 minutes with two 190Wh batteries? The Genaray Radiance is 230w LED. With two 190wh batteries you will bet about an hour and a half.